Sept. 8, 2009, 2:27 p.m.
By C.W. Anderson @chanders Sept. 8, 2009, 2:27 p.m. In my last post, I spent a lot of time laying out a fairly abstract framework for how we can think intelligently about future kinds of news organizations. I argued they could be usefully evaluated and charted on four factors: the type of work they do, how institutionalized they are, how many resources they have, and how open they are to outsiders. But the value of any model lies not in its elegance, but in the degree to which it can help us think about the world in a useful way — the way it can give us “tools to think with,” as the saying goes — and can help us solve practical problems. Note that by “solve practical problems” I don’t simply mean “figure out a business model for journalism.” Business models are important — but questions like “what kind of journalism best integrates with the nature of 21st-century democracy and society?” are also practical problems. So in this post I want to apply the model to a few real new organizations, describe what problems I think it might help us solve, and answer a few questions raised by my previous post. I think this model is useful because it can help us describe not only the way things are but also the way people think things are. That’s what I mean to get across in this first chart. In the early day of the read-write web, and even to an unfortunate degree today, journalists often tended to think of themselves as members of institutionalized, resource-rich, closed organizations that “did reporting.” In other words, as professionals. The stereotype about bloggers (and by extension, about all citizen journalists) was that they were completely open, ad hoc, resource-poor individuals who practiced the art of commentary (“guys in their pajamas”). I realize that there are are lot of generalizations in the preceding paragraph — but it isn’t as if these stereotypes have totally gone away. And this simplified vision can help us see that a more accurate picture of the new media ecosystem is a lot more complicated than the stereotypes. Here’s a application of the model I proposed in the last post, picking a few new and old media organizations out at random. There’s Gawker, which I mentioned last week. It sits near the middle of the “institutionalized–deinstitutionalized axis,” and is of moderate size and moderate openness. (It relies upon and integrates its commenters, but doesn’t do much “citizen journalism” per se.) Gawker tends to be further toward the commentary/link-gathering end of the spectrum than the reporting end (though not entirely). But where this starts to make sense is when we add other organizations — because now we’re not talking about absolute qualities of an organization but relational qualities. (The sociologist Pierre Bourdieu once argued that “the relational is the real.”) In other words, we can make statements like “Gawker is more focused on aggregation than Politico, which is more focused on original reporting. But Gawker is also more open and deinstitutionalized than Politico, too.” Or an even more interesting comparison, between Politco and the Chi-Town Daily News: Chi-Town is more open to amateurs and more deinstitutionalized than its D.C. counterpart, but both Chi-Town and Politico are closer to each other than they are to the old I.F. Stone’s Weekly, which sits at the far end of the deinstitutionalized axis (it was a one-man newsletter that did reporting). And so on and so forth. You might disagree with my exact placements here, so I’d urge folks to chime in, or try the exercise at home. 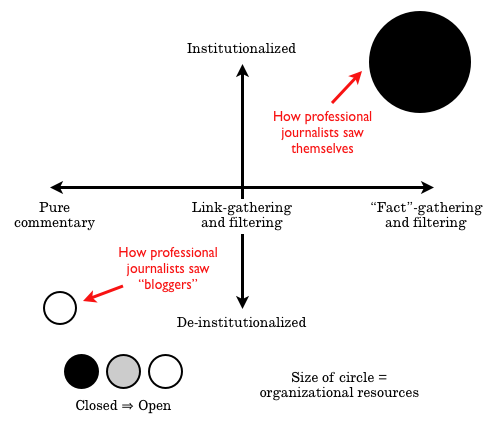 The area in which I think this little schema can be the most interesting, however, is tracking the progression of new journalism organizations over time. I’ve included two well known media projects here, each of which has shifted its position on the chart. Over time, Talking Points Memo has transformed from a small, deinstitutionalized organization doing mostly aggregation and commentary into a mid-sized, slightly less open institution engaging in a larger amount of original reporting. 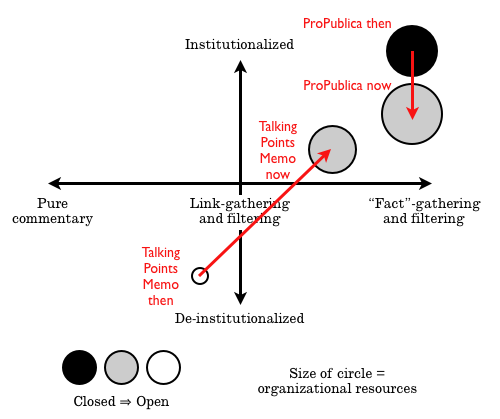 Over the same period, the website ProPublica shifted from a moderately institutionalized reporting outfit to a slightly larger and more open organization, primarily though its hiring of Amanda Michel and its adoption of a distributed reporting project alongside its traditional journalism. And it’s arguably true that the Huffington Post and the Daily Kos have made similarly important transformations over the years, while it’s also clear that “pure” blogs like Eschaton and Instapundit have stayed pretty much the same. So what is all this categorizing good for? I think it’s a good way to compare online news organizations, and plot the changes occurring in a news ecosystem over time. I think it’s a good way to finally break down that wall between so-called professional and amateur reporters, by putting them all on the same playing field. I think it might also be good in helping us sort through the terms getting tossed around more and more frequently as the debate over the future of journalism escalates: “aggregators,” “parasites,” “original reporting,” “linking,” and so on. I think it’s a good way to ponder the value and rarity of original reporting, especially on a local level, but it also helps us ask how fact-gathering is different from link-gathering. And I think it’s useful when we evaluate the merits of the various public-policy options being discussed to support journalism. What is this model not good for? As Matthew Powers points out in his comments on my original post, it’s not good at nuance, particularly at discussing how news organizations are internally divided. It’s not good at examining the links between different organizations and the ways in which these organizations network themselves into being. It’s more about stasis than process. It makes pretty broad generalizations and needs to be grounded in actual research. Finally, as Matt Mireles points out, it doesn’t talk about things like business models, nor does it score news organizations along any sort of ultimate hierarchy — only a relational one. In the end though, I think the benefits of engaging in these sorts of thought experiments are worth the time and effort they consume. They’re certainly more productive than calling bloggers “pipsqueaks” and participating in food fights. And while we’re all engaged in figuring out the future business models for news, it’s also worth a little time thinking about kind of journalism we want to see and how it all fits together in the larger news ecosystem. POSTED Sept. 8, 2009, 2:27 p.m.
Anderson, C.W.. "The future of news in 4 dimensions: How real news orgs fit in the model." Nieman Journalism Lab. Nieman Foundation for Journalism at Harvard, 8 Sep. 2009. Web. 23 Apr. 2019. 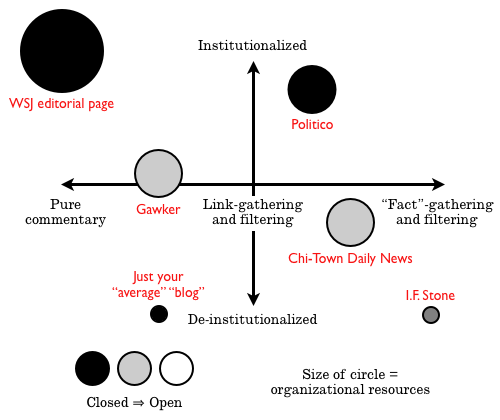 Anderson, C.W.. "The future of news in 4 dimensions: How real news orgs fit in the model." Nieman Journalism Lab. Last modified September 8, 2009. Accessed April 23, 2019. https://www.niemanlab.org/2009/09/the-future-of-news-in-4-dimensions-how-real-news-orgs-fit-in-the-model/.